If you’re a frequent online or mobile shopper, you’ve probably used Ebates (or a cash-back portal like it). Or maybe you’ve signed up for a retailer’s frequent buyer program or got a coupon code for signing up for their email list. Maybe you even tried to make the most of credit card perks. But have you ever tried to do them all simultaneously? Combining these tactics to rack up even bigger savings is called “app-stacking” — and it’s not as complicated as you think. "When the stars align, you can potentially earn rewards from a lot of different companies for one purchase,” says Greg Davis-Kean, founder of The Frequent Miler. The three types of rewards you can glean from this practice are stuff (clothes, home goods, and other items), travel (hotel rooms, flights, even Uber rides), and cold, hard cash. It is how it works: Shopping portals (also called cash-back websites) make money in commissions for sending consumers who make purchases to various online merchants. They give a slice of those commissions back to users in the form of cash-back. Stackers take it a step further by combining their use of these portals with additional savings from store rewards, coupons, and rewards credit cards. Here’s a step-by-step guide for stacking newbies. First, make a list of the top five or 10 stores you shop most. Then head to CashbackMonitor.com to find out which shopping portal offers the highest “base percentage” back for purchases at your chosen stores, says Justin Cupler, assistant editor at The Penny Hoarder. (This will vary slightly from day to day, so it’s a good idea to check anytime you’re planning to shop online.) There can be big discrepancies between the different services’ base percentage: For example, at press time, Extrabux was offering 13 percent cash back at Saks Fifth Avenue, while Ebates was offering just 4 percent back. Next, you’ll want to compare the value of cash back to other rewards. By shopping through the American Airlines portal, for example, you could earn 5 miles per dollar spent at Saks. So, if you spend $100, you’d earn $13 back or 500 miles. According to ThePointsGuy.com, American Airline miles are worth 1.5 cents a piece — so that’s $7.50. Unless you’re stretching to qualify for a flight, the cash is a better deal. Constant portal hopping, however, gets tiresome. That’s why it’s good to pick several that you’ll shop through on a regular basis. You’ll set up an account, and when you’re ready to shop, you go to the portal’s website and click through to your chosen store. If you buy something during your session, the portal adds money to your account. It usually takes one to three months for the check to show up, but you'll get an email within a day or two that your rewards are pending. Most credit card companies have shopping portals as well — Davis-Kean mentions that Chase has a good one — and in addition to American, most major airlines have portals. Next, take those same favorite stores and make sure you’re signed up for their points-based rewards program. These are free “99 percent of the time,” says Cupler. You’ll have to provide an email address for the best deals, but you can create a new one primarily for this purpose or set them up to go into their own folder in your email. “The problem with those programs is you can forget about them and might not use the rewards before they expire,” says Davis-Kean (who also warns against forgetting your login for the programs). His suggestion? Streamline them by using AwardWallet.com, a tool that keeps all that information in one place and helps you keep track of the rewards you’ve gained. Now, whenever you make a purchase, you’ll go from portal to the store and make sure that your rewards account is activated at checkout. If you’ve already got a wallet full of credit cards (the average American has between two and three), take a minute to make sure you understand what kind of rewards you get for paying with them. If you’re not sure, the Wallaby app (free for IOS and Android devices) will tell you which of your cards is best, rewards-wise, for whatever you're buying. But make sure you understand all your cards are offering. American Express credit cards are a “secret weapon” of stacking, says Davis-Kean, because of "Amex Offers” (which you can find under a tab like “Offers for You” upon logging in to your account). These vary regularly, but they’re typically 20 percent — like spending $100 at a store and receiving $20 back. Extreme stackers often get a number of authorized user cards for free, and each of those individual cards also gets Amex offers. “The reason this is so powerful is that when you’re stacking that 20 percent with sales, coupons, online shopping portals, store rewards, etc., it can add up to huge, huge savings,” says Davis-Kean. If you don’t have a rewards card, weigh which benefits are most valuable to you (cash back, miles, store rewards, etc.) and add one using a credit-card search engine to guide you. As a final note, you should only do this if you feel confident you can pay the balance off in full every month. Interests charges from carrying a balance will soon cancel out any rewards you earn, so if you do get a credit card, you should link it to your bank account and set it up to automatically pay off your balance in full every month. 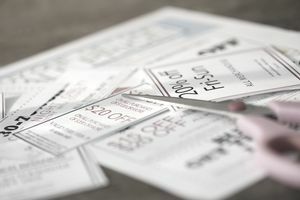 You can add coupons as the final stacking block — find them via Google or through aggregator sites like Couponaholic, Coupon Mom, The Krazy Coupon Lady, SlickDeals.com, etc. There are also browser extensions like Honey and Gumdrop that automatically look for coupon codes when you’re shopping online. So, putting all these things together, what would a stack look like? Davis-Kean outlines one multi-layered example using a $675 Tumi suitcase as the product. Tumi recently ran a 20 percent off promotion for their products; the promotion was extended to eBags, which has its own rewards program offering 5 percent rewards on all purchases. Additionally, one cash-back portal was offering 20 percent cash back from eBags. Finally, American Express was offering cardholders $15 back for any $75 or over purchase from eBags. After all the rebates and discounts, a crafty couponer could get the suitcase for $417 — a 38 percent discount from the original price — plus $27 in eBags rewards that can be spent anywhere on the site. As with any method of couponing or deal-hunting, it’s important not to give into the temptation to buy things you don’t need. The prospect of saving 40 percent might be enticing, but if you wind up buying a bunch of stuff, you didn’t need, you’re not saving money at all.